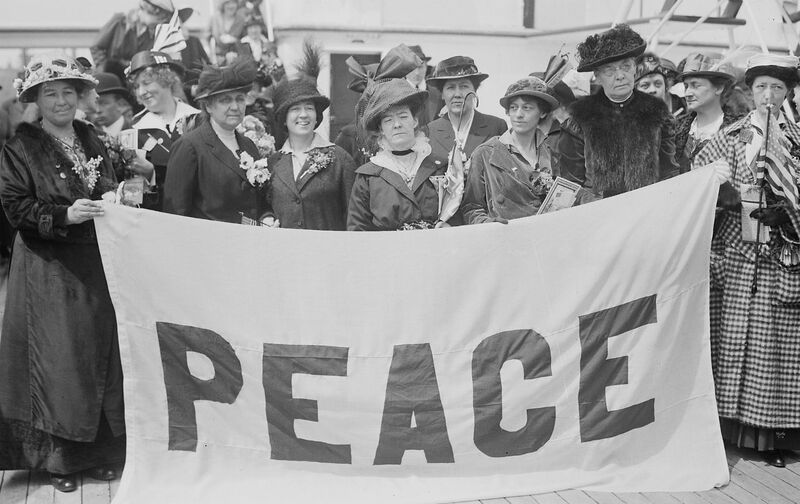 The Nation and the Women’s International League for Peace and Freedom have entwined histories, and, I think it’s no stretch to say, entwined destinies. Late in 1918, just after the Armistice ended World War I, just as The Nation, under its new pacifist editor Oswald Garrison Villard, was turning sharply to the left, a 51-year-old woman named Emily Greene Balch joined the staff of the magazine. Balch had first contributed to The Nation in 1891, when, just 24 years old, recently graduated from Bryn Mawr, she sent a long and meticulously-detailed dispatch from Europe, regarding a new law in France aimed at eliminating regressive property taxes. It was what we would today call wonky. Returning from Europe, Balch joined the faculty of Wellesley College, as a professor of sociology and economics. When hostilities erupted in Europe in 1914, Balch threw herself into the effort to secure peace and to keep America out of the war. In January 1915 she joined with Jane Addams, Carrie Chapman Catt and other activists to found the Women’s International League for Peace and Freedom. Wellesley eventually fired Balch for her pacifist activities, and she found a refuge at The Nation. She helped edit the new International Relations Section—basically an aggregation of articles and documents from overseas—with future Nation editor and publisher Freda Kirchwey and wrote unsigned editorial blurbs for the magazine. Kirchwey’s biographer Sara Alpern has written that Balch was known in the office for “absently nibbling raisins as she read clippings” and for her voracious knowledge of international relations; Kirchwey admired Balch’s intelligence and courage, calling her “the least self-conscious woman” she had ever met. Dissenting from Villard’s fervent stance, on anti-imperialist grounds, against the League of Nations, Balch left the magazine in 1919 and joined the Women’s International League full-time. With her dry and kindly sense of humor, her modesty, her integrity of mind, and above all with that priceless quality of spiritual intensity and vision, she has won the respect of sincere workers for peace everywhere. And in her they have all received recognition. The League’s work continues, as does The Nation’s. Back in February of 1915, one month after the League was founded, as war raged in Europe, as The Nation prepared its 50th anniversary issue, the photographer and peace activist Eve Watson Schutze wrote a letter to the editor of The Nation in which she said: “There is a patriotism greater than the claim of any one nation, which demands that wars, as a means of settling international difficulties or disputes, must be done away with…Not one of us has the right to remain a passive spectator to this carnage.” That message, sadly, and despite many successes, is as relevant today as it was a century ago. And it will continue to be heard so long as there is a Nation and a League—right up until the day there is, finally, at long last, a strong and meaningful League of democratic and peaceful Nations.